Harald I Harefoot was born around 1012 to King Canute and his mother was either Canute’s mistress or his first wife Elgifu of Northampton, the records are unclear. Harald acquired the name Harefoot for his speed and his exceptional skill in hunting. Harald would only rule England for five years until his untimely death at twenty-four. Upon Canute’s death he wished to divide his kingdom amongst his three sons; Norway to Sweyn, England to Hardicanute and Denmark to Harald. However Harald, who was acting as regent for Hardicanute, promptly took possession of the treasury and received the support of Earl Leofric of Mercia, the majority of the Danes and the Great Council or the Witangemot confirmed Harald of King of England. Ethelnoth, the Archbishop of Canterbury, refused to crown him, coronation by the Archbishop was a legal requirement for one to become King. The archbishop reportedly offered to perform the ceremony without the royal sceptre and crown, but the coronation without the royal regalia would have been an empty honour. Harald attempted to both bribe and threatened Ethelnoth, and when his attempts were unsuccessful, he rejected the Christian religion in protest and refused to attend church services. Instead, he spent his time hunting and living a life of leisure. It was not until 1037 AD that Harald, supported by Earl Leofric was officially proclaimed King. 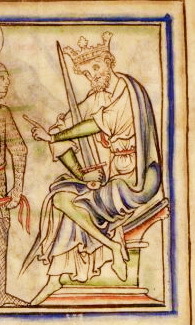 Queen Emma of Normandy, Harald’s half brother Hardicanute’s mother, had the support of the nobles of Wessex and managed to retain control of the area. She acted as regent for her son while Hardicanute remained in Denmark and she attempted numerous attempts to unseat Harald. When Canute died, the sons of Ethelred the Redeless, Edward and Alfred were in exile in Normandy. Upon hearing the news, they gathered a fleet and sailed for England; however, when Edward reached Southampton, he found the town up in arms against him as they were unwilling to accept any descendant of Ethelred and he no choice but to return to Normandy. Harald had a short but brutal reign in England. The powerful Earl Godwine understanding the royal situation turned his loyalties from Queen Emma to Harald. Alfred upon visiting his mother in England was captured by Godwine and his followers deserted him. While being transported on a ship to meet his step-brother Harald he was blinded and suffered an agonising death due to his wounds, “At that moment, however, he was seized and bound together with all his men. Nine-tenths of them were then murdered. And since the remaining tenth was still so numerous, they, too, were decimated. Alfred was tied to a horse and then conveyed by boat to the monastery of Ely. As the boat reached land, his eyes were put out.” The failed invasions of Ethelred’s son shows Harald I Harefoot had gained the support of the Anglo-Danish nobility which had rejected the claims of Alfred and Edward; the House of Wessex had lost the support of the nobility in England. After this incident, Emma was forced into exile in Flanders and was joined there by her son Hardicanute and together they began to conspire to invade England with a fleet of sixty warships. The invasion was unnecessary as Harald on March 17, 1040, at the age of twenty-four died. The cause of his death is uncertain though an Anglo-Saxon Chronicle attributes it to divine judgement. Harald, I Harefoot was buried at Westminster but upon Hardicanute’s arrival in England his body was exhumed and was beheaded and thrown into a swamp bordering the Thames. Fishermen later recovered it and reburied Harald’s body in the St Clement Danes cemetery. Harald may have had a son, Elfwine, by Elfgifu who may have been his wife. Elfwine later became a monk in Europe under the name Alboin and had been recorded in charters from the Abbey Church St. Foy in Conques as the son of, “Heroldus rex fuit Anglorum” (Harald, who is King of the English). There are very few records from Harald’s time as King so not much is known about his reign and success as a ruler. Material from the Prose Brut Chronicle, an Anglo-Norman work, covered British and English monarchs from Brutus of Troy to the death of Henry III in 1272. The text includes multiple notable errors, the original author remains unknown, and there had been some continuations in different hands. 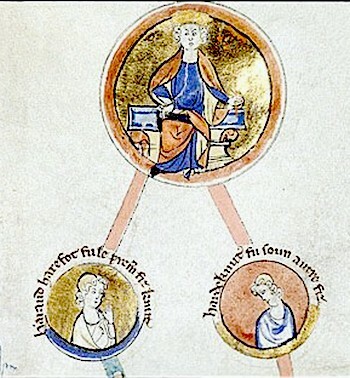 In this chronicle Harald I Harefoot is portrayed in an unflattering light, the author deemed Harald and Hardicanute as the sons of Canute and Emma of Normandy. Harald, “…went astray from the qualities and conduct of his father King Canute, for he cared not at all for knighthood, for courtesy or for honour, but only for his own will.” The author also accuses Harald of driving his mother Emma out of England on the advice of Godwin, Earl of Wessex. Of course, it is unknown exactly who Harald’s mother was. The Knylinga Saga frequently confused familial relations and chronology, but it also considered Harald to be the eldest son of Canute and Emma. This narrative has Harald and Hardicanute dividing the realms of their father in agreement; as opposed to Harald taking England by treachery and force.